Daniel Tammet’s understanding of language began with numbers. When he saw white flakes falling from the sky, though he pointed out the window and exclaimed “Snow” to his parents, his mind latched onto the number 89. But while numbers ruled his thoughts, eventually words — rich, buoyant, pliable words — edged their way into his fascination, triggering a ferocious zeal for languages. 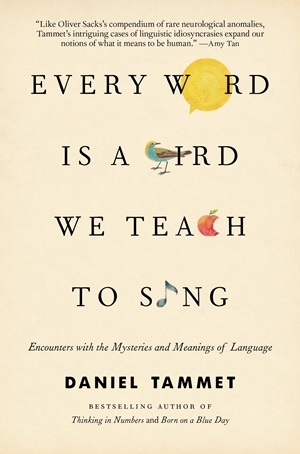 In his collection of essays, “Every Word Is a Bird We Teach to Sing,” Tammet takes readers on a cerebral jaunt though spoken, printed, championed and neglected words. In one essay, he burrows into the origins of Esperanto, roams through the history and expounds upon its current state, all with poetic prose. In another, a sign-language user coaxes the author’s hands into meaning. Dictionary bosses in France explain the nuances of allowing this definition or that one onto pages, and from those who study the telephone, we learn why answering “Hello” bested “Ahoy” regarding the proper fashion to answer a call. Tammet explores some cultures’ efforts to preserve nearly forgotten vocabularies, providing a snapshot of a language’s possible final moments, when the last handful of elders maintain only a rusty collection of phrases held over from childhood. Later, a missionary recounts the complexity of translating Jesus’ teachings of sowing and seeds for the 4,000 Amanab speakers in a remote village of Papua New Guinea who possess no word for plow. Each essay quaintly reveals intricacies embedded in the way humans communicate, from parents in Iceland grappling with authorities over what they can name their daughter to the African writer fighting for youth to read in their mother tongues.